All breathing, existing, living, sentient creatures should not be slain, nor treated with violence, nor abused, nor tormented, nor driven away. 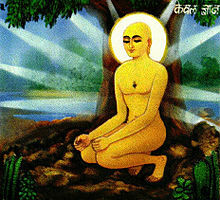 ~ Mahavira. Śvētāmbara (White clothed) Jain Munis. Jainism /ˈdʒeɪnɪz(ə)m/, traditionally known as Jaina dharma, is an Indian religion which prescribes paths of Ahiṃsā, or nonviolence towards all living beings, and which emphasizes a spiritual interdependence of all forms of life. Practitioners believe that nonviolence and self-control are the means by which all obtain liberation. Another central and fundamental doctrine is anēkāntavāda, a non-exclusivity which reveres principles of pluralism and multiplicity of viewpoints, emphasizing the truth that reality is perceived differently from diverse points of view, and that no single point of view is the complete truth. He who harms animals has not understood or renounced deeds of sin...Those who are at peace and who are free from passions do not desire to live at the expense of others. Some slay (animals) for sacrificial purposes, some kill (animals) for the sake of their skin, some kill (them) for the sake of their flesh, some kill them for the sake of their blood; thus for the sake of their heart, their bile, the feathers of their tail, their tail, their big or small horns, their teeth, their tusks, their nails, their sinews, their bones 1; with a purpose or without a purpose. Some kill animals because they have been wounded by them, or are wounded, or will be wounded. He who injures these (animals) does not comprehend and renounce the sinful acts; he who does not injure these, comprehends and renounces the sinful acts. Knowing them, a wise man should not act sinfully towards animals, nor cause others to act so, nor allow others to act so. He who knows these causes of sin relating to animals, is called a reward-knowing sage. (He thinks) I have to provide for a mother, for a father, for a sister, for a wife, for sons, for daughters, for a daughter-in-law, for my friends, for near and remote relations, for my acquaintances, for different kinds of property, profit, meals, and clothes. Longing for these objects, people are careless, suffer day and night, work in the right and the wrong time, desire wealth and treasures, commit injuries and violent acts, direct the mind, again and again, upon these injurious doings. Having acquired it (i.e. wealth), employing bipeds and quadrupeds, gathering riches in the three ways, whatever his portion will be, small or great, he will desire to enjoy it. Then at one time, his manifold savings are a large treasure. Then at another time, his heirs divide it, or those who are without a living steal it, or the king takes it away, or it is ruined in some way or other, or it is consumed by the conflagration of the house. Thus a fool doing cruel deeds which benefit another, will ignorantly come thereby to grief. This is the pure, unchangeable, eternal law, which the clever ones, who understand the world, have declared: among the zealous and the not zealous, among the faithful and the not faithful, among the not cruel and the cruel, among those who have worldly weakness and those who have not, among those who like social bonds and those who do not: "that is the truth, that is so, that is proclaimed in this (creed)”. According to Jaina tradition nine of the eleven disciples attained the highest knowledge of kevala during Mahavira's lifetime. The essential metaphysical ideas of Jainism are nine cardinal principles. The universe is divided into that which is alive and conscious (jiva) and matter which is not (ajiva). Jivas (souls) are either caught by karma (action) in the world of reincarnation (samsara) or liberated (mukta) and perfected (siddha). Though their number is infinite, jivas are individuals and each potentially infinite in awareness, power, and bliss. Matter (ajiva) is made up of eternal atoms in time and space which can be moved and stopped. Sandorson Beck, quoting Mahavira in "Ethics of Civilization Volume 2: INDIA & SOUTHEAST ASIA to 1800." Jain Sthanakvasi monk in Meditation. Gandhi’s adherence to the philosophy of non-violence, non-possession, community welfare throughout his life can directly be attributed to the basic teachings of Jainism. A rise of Jain fundamentalism would endanger no one. In fact, the uncontrollable spread of Jainism throughout the world would improve our situation immensely. We would lose more of our crops to pests, perhaps (observant Jains generally will not kill anything, including insects), but we would not find ourselves surrounded by suicidal terrorists or by a civilization that widely condones their actions. Jainism actually is a religion of peace. The core principle of Jainism is non-violence. Gandhi got his non-violence from the Jains. The crazier you get as a Jain, the less we have to worry about you. Jain extremists are paralysed by their pacifism. Jain extremists can't take their eyes off the ground when they walk lest they step on an ant... Needless to say they are vegetarian. Sam Harris, Q&A with Sam Harris (2005). When I was a schoolboy in England, the old bound volumes of Kipling in the library had gilt swastikas embossed on their covers. The symbol's 'hooks' were left-handed, as opposed to the right-handed ones of the Nazi hakenkreuz, but for a boy growing up after 1945 the shock of encountering the emblem at all was a memorable one. I later learned that in the mid-1930s Kipling had caused this 'signature' to be removed from all his future editions. Having initially sympathized with some of the early European fascist movements, he wanted to express his repudiation of Hitlerism (or 'the Hun,' as he would perhaps have preferred to say), and wanted no part in tainting the ancient Indian rune by association. In its origin it is a Hindu and Jainas symbol for light, and well worth rescuing. 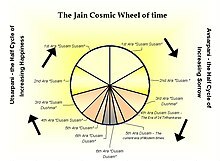 He (Jahangir) persecuted the Jains in Gujarat, and ordered that Jain monks should not be seen in his kingdom on pain of death. Goel, S. R. (2001). The Story of Islamic Imperialism in India. 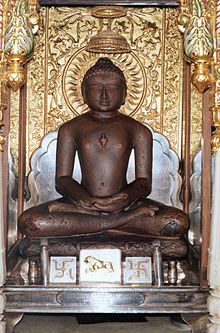 The interest of Jainism to the students of religion consists in the fact that it goes back to a very early period and to Primitive currents of religious and metaphysical speculations, which gave rise to the oldest philosophies Sankhya, Yoga and to Buddhism. Jainism has a distinct concept of underlying Thirthankara worship. The physical form is not worshipped, but their Gunas; virtues , qualities are praised. Thirthankaras remain role-models, and sects such as the Sthanakavasi stringently reject statue worship. Flesh can not be procured without causing destruction of life; one who uses flesh, therefore, commits himsa (injury) unavoidable. and possessed of an infinite knowledge. are present with me---constantly and continuously. by this acute form of austerity. it will work as the nondoing of karma for future. and from that, of the complete wearing out of all kinds of pain. Jainism: In happiness and suffering, in joy and grief, we should regard all creatures as we regard our own self. Namo Arihantanam - White Color: Arihant is a perfect human being. White color represents Arihant. The white color is the mother of all colors; it is a blending of all colors. It represents pure knowledge. Siddhanam - Red Color: Siddha is a pure consciousness or a soul without any Karma attached to it. Both Arihant and Siddha are known as Gods in Jainism. Red color represents Siddha. Namo Loe Savva Sahunam - Black Color: Sadhu (monk) is a spiritual practitioner. The practitioner must be protected from worldly attachments and must destroy negativity. Black color represents monk. Black is the absence of all color. It is receptive, consumes negativity, and gives the strength to fight negativity. Perfect release from all karmas is liberation. The path to liberation is the method by which it can be attained. The singular ‘path’ is used in order to indicate that all the three together constitute the path to liberation. This controverts the views that each of these singly constitutes a path. Hence it must be understood that these three— right faith, right knowledge and right conduct — together constitute the direct path to liberation. 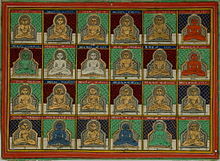 Jainism has a complex classification of Jnana or knowledge, and the means of understanding reality. "Some foolish men declare that the creator made the world. The doctrine that the world was created is ill advised and should be rejected. If god created the world, where was he before the creation? If you say he was transcendent then and needed no support, where is he now? How could god have made this world without any raw material? If you say that he made this first, and then the world, you are faced with an endless regression." May the sacred stream of amity flow forever in my heart. May the universe prosper - such is my cherished desire. May my heart sing with ecstasy at the sight of the virtuous. May my heart bleed at the sight of the wretched, the irreligious, and my tears of compassion flow from my eyes. May I always be there to show the path to the pathless wanderers of life. Yet if they should not hearken to me, may I bide in patience. you will be happy in this world and the next. for one's works are very powerful. nor a Tapasa by wearing kusha-grass and bark. and a Tapasa by penance. or a Kshatriya or a Vaisya or a Sudra. Variant translation: All life is bound together by mutual support and interdependence. Swami Vivekananda appreciated the role of Jainism in the development of Indian religious philosophy. In his words, he asks: "What could have saved Indian society from the ponderous burden of omnifarious ritualistic ceremonialism, with its animal and other sacrifices, which all but crushed the very life of it, except the Jain revolution which took its strong stand exclusively on chaste morals and philosophical truths? ↑ Jain, S.A. (1992). Reality (Second ed.). Jwalamalini Trust. "Non-Copyright"
↑ Jain, Vijay K. (19 April 2011), Tattvārthasūtra (1st ed. ), (Uttarakhand) India: Vikalp Printers, ISBN 81-903639-2-1, "Non-Copyright"